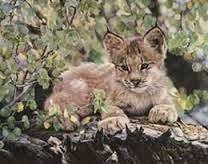 In the Spring, a kitten was born to a lynx family. His parents named him Patch, which means noble. Patch was a happy kitten being taken care of by both parents which is rare because normally only the mom raises kittens. 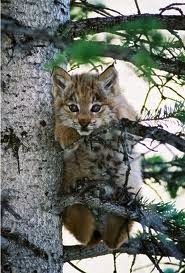 This Lynx family lived in North America where it gets cold and the snow is measured in feet. The region is unpredictable and sometimes cruel. Patch grew fast. His mom fed him well, playing with his food before devouring it. He father taught and rough housed with him. He didn’t have any worries. But one day a tragic thing happened. The snow started to melt and shift. His mom chased a rabbit. She had almost caught the fast running rabbit when there was a loud crack. A giant shelf of snow and ice sheared off the face of a cliff. The snow and ice slid down the mountain getting bigger and bigger gathering more snow. It grew into a huge avalanche! The avalanche took everything in its wide path including the two running animals who couldn’t out run it. They didn’t have a chance of escape! Patch’s mom died in that avalanche. His dad held him tight as he gave Patch the news. Patch cried all night. Now, there were only two of them and his dad would need to raise this young kitten. His dad, Lancel, worried how to raise Patch by himself. 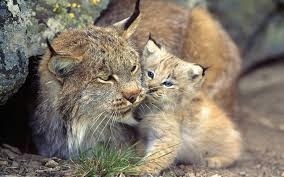 Male lynx don’t normally raise their young. Lancel did his best. He hunted food for them and started training Patch. At first Patch was sad. He missed his mom. Thoughts of her purrs and smell made him sad. He even missed his bath. For more than a week he moped around. Lancel was concerned for Patch. One day he couldn’t find Patch. He searched all around their den. Lancel released the ground squirrel. The squirrel scurried away. Patch waited then leapt on it. Lance notice this was getting too easy for Patch and he would need to make the catch larger and the chase more difficult. “Thanks Dad, that was tasty.” Patch said as he licked his paw and rubbed it on his face. They leaped around sometimes from rock to rock or on the ground. Patch tried to leap as far as possible. A stick or a rock was used as a target. One time, Patch jumped off a rock and took a tumble. Splat! He slid into a large muddy puddle. “Are you alright?” asked his dad. Patch’s legs twitched as he dreamt of chasing animals around the meadow. The next day his dad gave him pointers and observed Patch seek out prey. Lancel was correct, the day was long and tiring for Patch but he was rewarded by catching a small mouse. Every day they hunted and Patch was becoming a competent hunter. Together they took down a small deer. A few days later, snow fell from the sky. Patch ran around licking at the flakes. Lancel laughed at his antics. Lancel laughed and stuck out his tongue. He hadn’t done that since he was Patches age. Lancel marveled at the joy Patch brought to small ordinary things. “I love the snow!” said Patch. Lancel was thankful that Patch was doing so well after his mom died. Patch could have turned out differently. Patch had an amazing attitude. Lancel was proud of his almost grown kitten. Soon, Patch would be able to live on his own. He just hoped it was not too soon. He loved having him around. Psalm 107:1a Oh give thanks to the Lord, for He is good! 1Thessalonians 5:18 in everything give thanks; for this is the will of God in Christ Jesus for you. Thank you for this story for children. I think you hold the children's interest and that it would be a good story for families - a bit similar to Bambi (an all time favorite) but with new characters. Good job! Dear Margery Warder, Thanks for reading and taking the time to encourage! Blessings!